The project allowed us to reconsider the potential of a compact outdoor space, by dismissing the typical planar typology of terrace gardens. 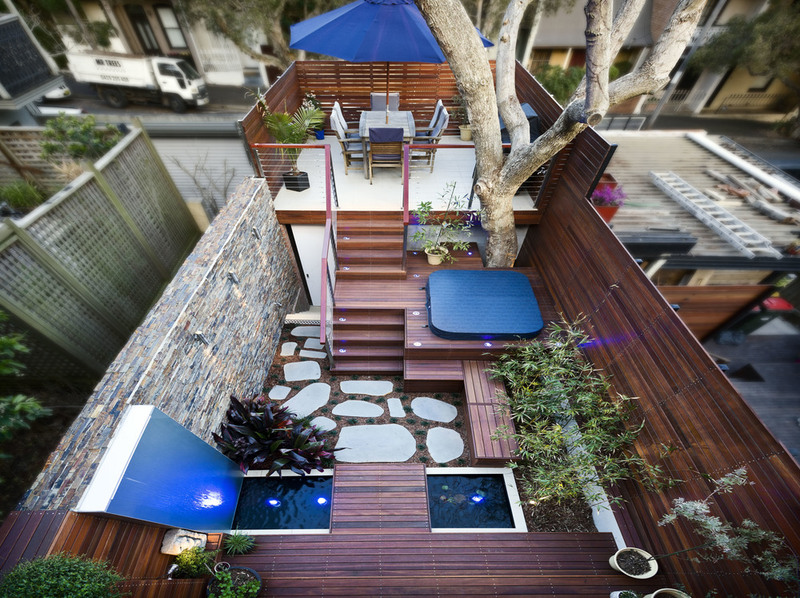 Instead, we opted to integrate a series of tiered platforms that engulfed a hidden garage. The platforms allow for the delineation of spaces for different functions, the garden was separated into a place to sit, play and eat. The simple concepts were derived from an ongoing discussions with the clients about how they wanted to utilize the garden. The space is grounded by the timber, stone and water features that are offset by a striking metallic screen and warm metallic lighting creating a Balinese styed escape, in the heart of Sydney.